Some friends and colleagues have been passing around a photo challenge, to post one black and white image every day for five days. Posted on FaceBook among us, we got to see some work from long ago to some from the present with a brief story of why. To be a photographer is to be a witness to life, the good and bad it offers. It’s not just one event that sums it up but it can be just one picture. This picture had nothing to do with the actual shoot of mother daughter for a series on South Beach. It was a stolen moment while patiently waiting for the cooperation of a little girl, a bonding of parent and child, a trust, that leads hand in hand into an unknown, the first step, hesitant yet confident in her mother’s hand. There’s a moment in a photographer’s time, that one or two hundredth of a second when you know what you’ve caught, plays out a lifetime, sometimes theirs, sometimes your own. 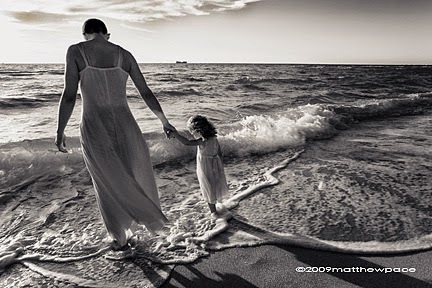 For me this image brings back many memories of me and my daughter at that time in her life. 14 Dec	This entry was written by MiamiVisual and published on 14 at 8:44 pm. It’s filed under child, mother, mother and child, parent, parenting, trust, uncertainty, what future brings. Bookmark the permalink. Follow any comments here with the RSS feed for this post.